Happy Monday! I got a bit of a slow start this morning after a late night, but I think my new habits will help me get off to a good start in spite of that “I want to go back to bed” feeling. I’ve checked a couple of items off my list already, and now blogging is easing me into mid-morning. As I look around my home at all of my stuff, I can tell that meditating on this verse may not always be pleasant. I may need to ask some questions of myself along the lines of “what do I value most?” and ask some questions of God along the lines of “how do I align my values with yours?” I may need to take some action. I may need to say I’m sorry. I am sure to find some connections to that little word for 2015, humble. But even then, there is joy. 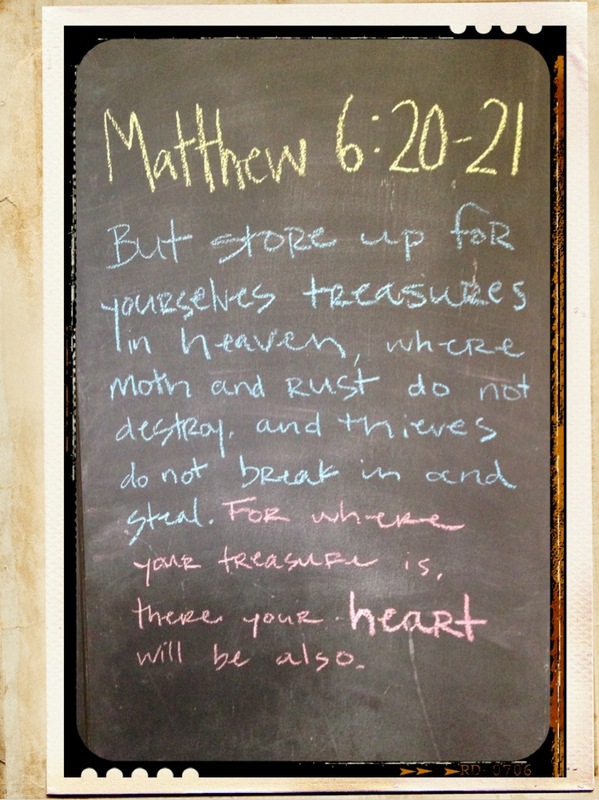 Joy that it is possible to store up for myself treasures in heaven that I will eventually enjoy in God’s presence. Joy that I can learn God’s Word, and that it changes my heart. p.s. I used the app Rhonna Designs to edit my photo.